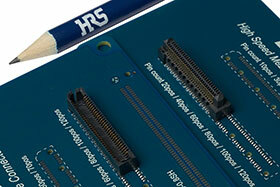 RS Components has introduced the Hirose ER8 series of 0,8 mm board-to-board connectors for industrial and medical applications. ER8 series PCB connectors combine rugged construction with high-speed transmission at data rates of over 10 Gbps, comfortably exceeding the IEEE802.3ap backplane Ethernet specification. The contacts of the ER8 series are optimised for high signal integrity to ensure fast, reliable data transmission. Using staggered GSSG pin assignments allows 85 Ω differential impedance to be achieved, reducing crosstalk. An excellent ICR (insertion-loss to crosstalk ratio) with 5-aggressor differential far end crosstalk (FEXT) comfortably exceeds IEEE802.3ap 10 Gbps requirements. The ER8 series includes a wide range of 0,8 mm pitch PCB headers and sockets in parallel stacking (mezzanine) and right-angle configurations. The parallel connectors come with 10, 20, 30, 40, 50, 60, 70, 80, 100 or 120 contacts, and permit vertical stacking heights from 7 mm to 12 mm. Right-angle connectors are currently offered with 120 contacts. The rated voltage for the Hirose ER8 series is 100 V, and the current rating is 0,5 A.